This is such a fantastic recipe for any chocoholics. They will only take you 5 minutes to make, & 30 minutes to set. They are actually good for you too! Finally you may eat & enjoy chocolate knowing you are feeding your body exactly what it loves with so many amazing health benefits. Add all the ingredients & sieve the cacao powder into a saucepan on a low heat & gentle melt them together mixing thoroughly. Do not let the ingredients boil. Once melted, spoon the ingredients into your chocolate molds & place in the freezer for 30 minutes so they set . You will need to store these chocolates in the fridge so they keep fresh. In its raw state, chocolate (raw cacao) has more than 300 nutritional compounds and is one of the richest sources of antioxidants of any food on the planet! Minimally processed raw chocolate contains many vital vitamins and minerals such as magnesium, and other essential minerals such as calcium, sulfur, zinc, iron, copper, potassium, and manganese, polyphenols, antioxidant rich flavonoids, vitamins: B1, B2, B3, B5, B9, C, E, essential heart-healthy fat: oleic acid a monounsaturated fat, protein & fiber. Coconut oil contains a large proportion of saturated fats (the good type HDL) which is a good cholesterol, which helps lower the level of bad cholesterol in your body & is crucial for keeping your body in excellent working order; from building cells, to producing hormones that control your metabolism, & carrying fat busting vitamins & minerals. Additionally coconut oil boosts your immunity while fighting the process of aging. Cacao butter comes from the oils of the cocoa bean. It’s 100% plant based, & is also vegan & kosher friendly. It’s organically grown & contains no added preservatives or chemical stabilizers. Maple syrup is naturally produced from the sap of trees. Its important to ensure your maple syrup is 100% organic & check there are no additives or refined sugars in your brand. Date syrup is a delicious way of adding sweetness without adding additional sugar. Date syrup is packed with potassium & contains iron & magnesium. This natural syrup really makes these chocolates tastes so much more decadent & luxurious because of its indulgent sweet taste. I would highly recommend investing in a chocolate mold because I know this is a recipe you will definitely wanting to on numerous occasions. If you want to try this recipe without a chocolate mold, I would recommend using your ice tray as a temporary replacement. 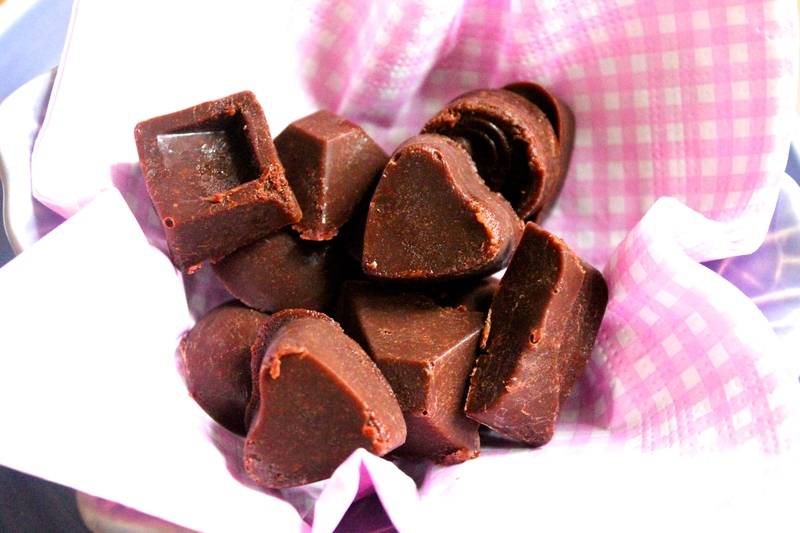 This recipe is incredibly delicious & these chocolates are very rich & luxurious in taste & texture. Its wonderful to eat food that tastes so divine & contains so many health benefits. Hi, You could use medjool dates mixed with vanilla essence & hot water instead of date syrup as its made from dates. Please do let me know how you get on? Would this be alright for diabetics please could you reply to me at my email address. I would be so grateful . Even though these chocolates are healthier than shop bought ones, please be mindful that they do contain natural sugars. Everything in moderation should be fine, perhaps only have limited portions over a few days as they do store well.